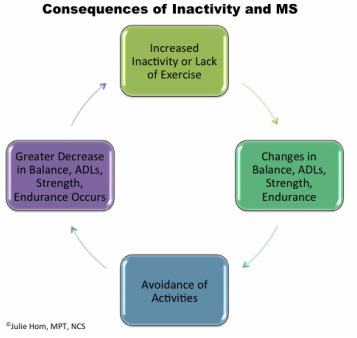 Staying Active - What Is Appropriate Exercise For People With MS? I am not a Physical Therapist. I am not a Fitness Trainer. I do, however, spend a great deal of time working with my patients on reasoning out solutions to problems. The issue of “exercise” comes up. When to exercise, how much to exercise, what is appropriate exercise and if you can’t exercise the way you used to does that mean you will never exercise again? So what is exercise to you? Are you someone who likes to go to the gym? Are you someone who would rather be outside? Stop, think this through. Can you still do that? Great. Do you need to scale down the intensity of the workout so fatigue doesn’t become unmanageable? That’s great, it’s different- but not worse- and you are staying active. What if going to the gym is no longer manageable? What kind of exercise can you do around the house? I am not at your house- so you need to think. Here are some things my patients do. When you go get the mail, walk a few laps around the driveway. Remember to take your cane or walker if you need it. You will be able to walk a little further and easier with the device than without it. Consider, when you wash floors, or clean the tub, if the kneeling to standing makes you out of breath, that is a little bit of exercise. People think that because they are not doing those exercise programs on TV, going to the gym or swimming laps that they are not exercising. But stop, think. Exercise can be anything. What is realistic exercise for you? Staying Active. What does that mean? Staying Active. To some, maybe to many, staying active could mean going to the gym and running or lifting weights 5 days a week. It could mean coaching the kid’s soccer team. It could mean biking five miles every morning before work. It could. To some, staying active could mean walking the dogs a mile every day. It could mean keeping up with the kids, all day, every day. It could mean doing that extreme exercise program that’s advertised at all hour of the night. But, does staying active have to mean exercises that require walking and balance? Exercises that require sweating? Does it have to mean that? To my patients, staying active is volunteering at a youth center one day a week, three short grocery trips spread out over the week and two daytime yoga classes- followed by helping the spouse and kids around the house as much as possible. To others, staying active means pacing oneself over the day, so fatigue never really sets in. This usually means short bursts of activity followed by rest and/or powernaps. It can also mean shopping, cleaning bill paying in the morning, then sleeping for two hours to have the energy to manage the kids when they arrive home. What does staying active mean to you? I met a man recently who was a performance athlete. His sport was cycling. As I listened to him talk about training and extreme exercise routines, I remember thinking that I could envision nothing less pleasant. However, in all honesty, I would happily hike up the side of a mountain every day (notice I said up, I really dislike coming down). I can also spend hours swimming and playing around in any body of water (salt or fresh) that happens to be in the area. I will swim past the point where my fingers and toes prune. I love walking my dogs. When my kids were younger, I really enjoyed kicking a soccer ball around with them. 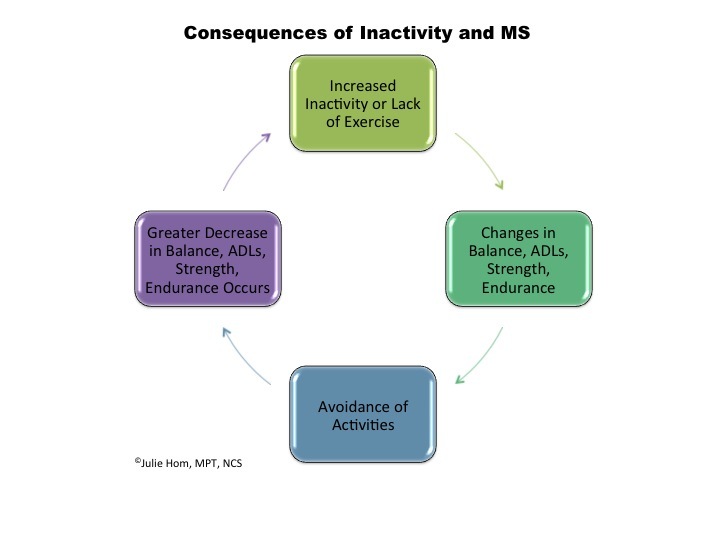 It is important that all of you with Multiple Sclerosis stay active. But, this is a challenge given some of the changes that are happening with your muscles, with your ability to breathe well, changes in your vision, and with your level of fatigue. And you have to be careful, too much activity can lead to that level of fatigue that will knock you flat for three days. So let’s go back to this- It’s OK to do things differently now. Different doesn’t mean better or worse. There’s nothing wrong with any of them. Depending on the person, and that person’s current level of function, progression of the disease process, motivation, all of these statements could come true. Or these statements could indicate that a person is being unrealistic. You are all so different. The concept that I am going to try to convey is you all need to have goals, it is good to have goals, and goals give us all something to work towards. But, there are achievable goals, and then there are those goals that are not realistic given a person’s current level of function, progression of disease process and motivation. As a therapist, I write goals as part of my treatment plan for all of my patients. I was trained that all goals have 3 parts. First, there is the behavior – what are you going to do, and it has to be concrete and measurable. Second, there is what we call accuracy, how often is this behavior going to happen accurately. Third there are modifiers- is this behavior going to be completed independently or with help. So let’s work through a few goal setting activities. It’s going to be a beautiful day tomorrow. You want to go outside weed your garden and flower beds. The Weather Person says it’s going to be 80 degrees by noon. You have to buy dinner. And you have to pick up the dry cleaning. You have to get the kids off to school. You have to help them with homework after school. To me, as a therapist, these are not measurable goals. What does go outside mean? Is there a time component? Is this go outside between errands or dedicated time in a park? “Weeding” is one of those open ended tasks that has no end. Shopping is also one of those open ended tasks. So, this is a vague list, open to interpretation. And at the end of the day, even though you touched on all of these tasks, you may not feel like you “completed” all of them. -Go out into the back yard after the kids go to school and read for one hour (concrete, achievable time). -Weed the flower beds from the corner of the house to the back door before noon (concrete, achievable distance and time). The difference between the lists is a level of forethought and planning, and the second list is very do-able. You can check things off. All the tasks on the second list have a beginning and an end. One of the biggest challenges my patients have with setting successful day to day goals is being over ambitious, and being vague. Maybe ten years ago they could “wing” a lot of stuff, and end the day feeling that everything got done. But once the Multiple Sclerosis begins to affect mobility, ability to stay on task and recall of what to do next, “winging” things becomes much harder. Well, that goal has a concrete time on it. But, the task is vague. What does clean the house mean to you. I bet it means something different to every one of you reading this. And it’s an endless task. So stop, think. If you were going to clean your house, where would you start? I tend to start in the rooms where I spend the most time. When my husband cleans, he starts in the kitchen, always. There’s a sequence to the tasks, an order to the tasks. They are concrete and achievable. When I ‘m done with these, I make plans for cleaning the bathroom on another day. My next blog will be titled "Staying Active - What's Appropriate Exercise for you? As we move into the New Year, we are all making resolutions. Some of them (maybe many of them) are straightforward...lose 10 pounds, be more organized at work, or keep the house clean. Most of us strive to do something “better”, to “improve” or to try something new. But what happens when that falls through? And let’s be honest, by February, many of the goals we made are beginning to slip (I did not say all...congratulations in advance to all of you who will still be sticking to your resolutions in February) and then feelings of frustration can begin to set in. So, since it is early in the year (and early enough to adjust that resolution), how about this resolution - taking care of yourself, first and foremost. So, what does that mean? It means something different to every person reading this. Every person with MS has unique life circumstances, needs, desires, dreams and goals. Every person with MS wants the symptoms of MS to interfere with their lives as little as possible. But, let’s be realistic, those symptoms are there, changes are happening. Taking care of yourself may not mean doing things “better”, but rather doing things “differently”. For example, is everyone reading this 100% adherent to their medication schedule? Does everyone reading this plan the day to try to get ahead of issues before they become BIG issues? Does everyone go to bed every night feeling like something was accomplished that day- that something got done? Does everyone reading this practice good energy conservation strategies, resting before you get tired, good body mechanics, so that you have energy to be with your family and friends in the evenings? Can you think of ways to adjust work habits, or routines at home? Not to be better, but different- to allow you to take care of yourself. You cannot take care of anyone else, unless you take care of yourself first. As a therapist, this can be a hard concept to communicate to some of my patients. We are surrounded by a society that goes, non-stop, all the time. We want to keep up. We want to be successful as parents, in the work place, and in the community. We want our children to participate, and to explore their talents while they are young. When the symptoms of MS flare up, the temptation may be to ignore them and keep going. Which may, unfortunately, bring on more symptoms. So… what can be done differently to keep this from happening? That is up to everyone reading this to decide- what can you start doing differently, TODAY, to take care of yourself. For example, the hamstring and hip flexor muscle groups are often commonly affected in individuals who sit for prolonged periods of time. Standing up and walking are methods that we naturally stretch our muscles to combat the risk of contractures. If an individual is unable to stand and walk regularly on his or her own, it becomes even more important to manually stretch the muscles regularly to combat the risk of contracture. Prevention is essential. A physical therapist will work with you to establish a stretching and strengthening program to prevent contractures. Note: the information that is being provided is for "Advice Only" for individuals in California. When Should You Consider Having a Physical Therapy Balance Evaluation for Multiple Sclerosis? Watching your feet while you walk. Avoiding specific walking challenges – For example, you choose to walk the long way to the ramp instead of stepping up a curb. Furniture walking – You might find yourself putting your hand from the wall to the sofa, to a chair, etc. for stability while walking indoors. This is not a complete list, but rather some of the common signs that I see in my practice. If you feel you can relate to any of these, talk to your physician or physical therapist about having an evaluation. It is beneficial to get started early before you develop bigger issues, such as a fall. 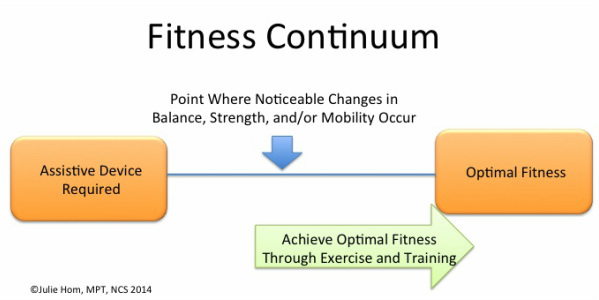 Physical therapy and exercise can be the “cog in the wheel” to prevent loss of and even improve upon your balance, strength, endurance, and functional mobility/ADLs (Activities of Daily Living). Have a physical therapist in your area assist you in a personalized and progressive exercise plan. It should be tailored to your current needs. Ideally, your physical therapist has a neurologic emphasis and expertise in balance and fall prevention. Start small with implementing a program and gradually progress according to your PT’s recommendations. When is the right time to start physical therapy? It is ideal to get started with a physical therapist when you first receive your MS diagnosis. A physical therapist will help you preventatively and establish a baseline even if you are not having symptoms with your strength, balance, or mobility. If you have been previously diagnosed with MS, it is still the right time to connect with a physical therapist. Like in many medical conditions, early intervention is key. Everyone has room for improvement with their fitness level whether or not they have a MS diagnosis. So let’s get started exercising and be sure to follow any precautions outlined by your healthcare provider! Have you noticed that you tend to catch your toe on occasion while walking? This can be the start of foot drop, a condition caused by weakness in the muscles of the lower leg. It may start off slow where the toe catch occurs only after fatigue or prolonged walking. It can progress to you being unable to lift your foot throughout the gait cycle. Foot drop is a contributing factor to the risk of falls and is therefore important to address as soon as possible. There is a greater risk of falls when walking on area rugs, uneven surfaces (such as grass), and uneven pavements. Foot drop also contributes to increased energy expenditure with walking. The goal of foot drop management is to support the foot without over-bracing. If the leg is fully supported with a brace, secondary weakness develops due to muscle inactivity. Speak with your physical therapist and/or orthotist to determine which option is best for you. Below are some of the possibilities. They are listed from minimal to maximal support. Your therapist and orthotist try to find the brace that offers the least constraint while offering optimal control of the foot, ankle, and knee throughout the gait cycle which is dependent our your symptoms. 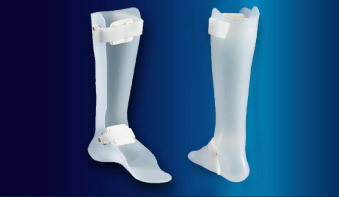 3) AFOs (Ankle Foot Orthoses) – these braces range from light to maximal support and can be made from metal and plastic. They can be issued off-the-shelf or customized to your foot. Does Physical/Occupational Therapy Help with Symptoms from MS? Have you tried physical therapy and/or occupational therapy and felt like it did not help your MS symptoms? It’s likely you will still benefit from physical therapy, but you need a therapist with the right tools in their tool belt to achieve optimal results. Standing frames are devices used to offer the benefits of assisted weight-bearing in stance. They are used for individuals who have difficulty standing on their own. An individual transfers into the chair of the frame and then uses a lever to crank the seat up into a standing position. There are many different types of frames with varying features. Speak with your health care provider to determine if you will benefit from the use of a standing frame. Some insurances will cover the cost of a standing frame with appropriate justifications and documentation from your provider.